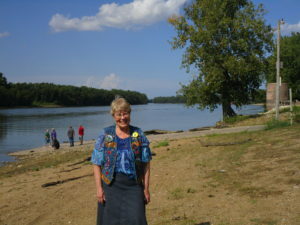 A few hours after leaving the Big Tree at Island Grove, we crossed the Illinois River, another emotional moment for me. We crossed over on a big bridge, but in 1838, the 840 Potawatomi had to cross on hastily put-together flatboats, wagons and all. Though the river was calm the day we crossed, storm surges could make it a dangerous crossing. That is how it was in TWO-MOON JOURNEY when Simu-quah and her family crossed over. Nemosh, the puppy fell into the roiling waters, which set in motion an attempted rescue that impacted everything else that happened afterwards. 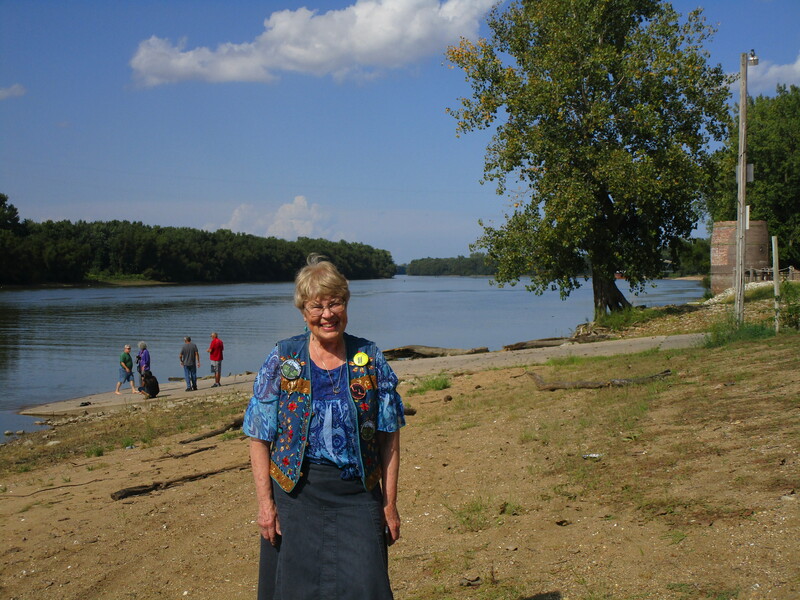 A truly pivotal moment of the book, which is why I was feeling close to tears as my daughter Linda took this picture of me on the banks of the Illinois River. © 2018 Peggy King Anderson. All rights reserved.